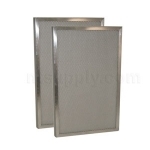 You will receive 2 filters (each 12-7/8" X 24-1/4") when combined will measure approximately 24-1/2" x 27". Efficient slide in media filter that can be washed. After washing - allow filter to dry completely before reinstalling.